David Chang opened his three Momofuku restaurants and a cocktail bar in Toronto with some serious hype and fanfare this past fall. 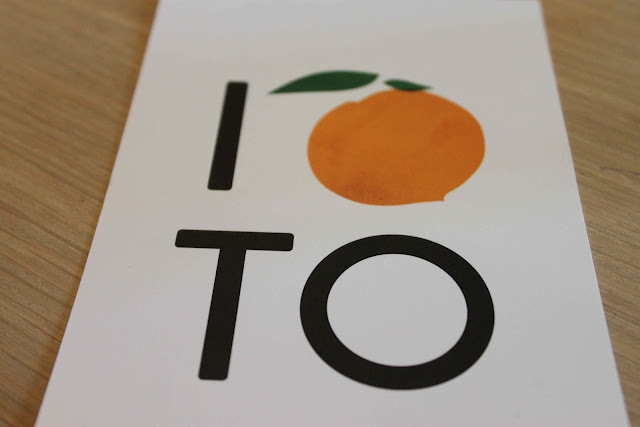 I was a serious Momofuku Noodle Bar fan whenever I visited NYC, so I was stoked when I heard that Toronto was getting a mega Momofuku complex inside the new Shangri-La Hotel in downtown Toronto. So does it live up to the hype? Most definitely. 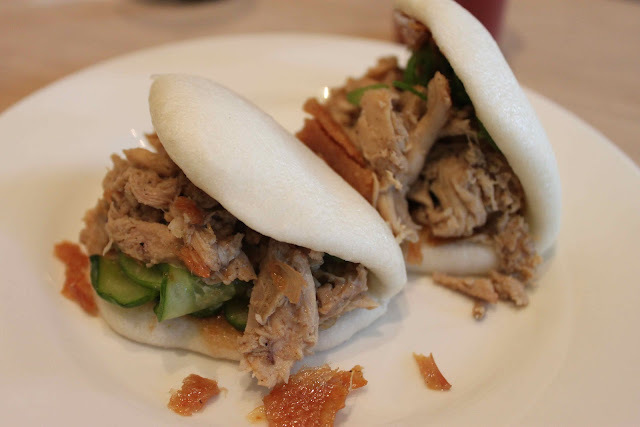 The Momofuku Noodle Bar is cheap and tasty which is a winning formula in my mind. The restaurant does not skimp, it delivers when I'm looking for Asian comfort food favourites like kimchi stew, ramen and meaty buns. 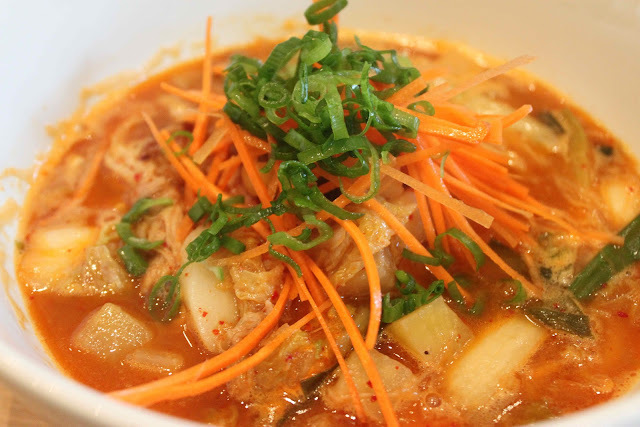 The Kimchi Stew is something I will definitely be coming back for over and over again. I've had a lot of kimchi stew in my day and this is nice and thick with chunks of rice cake to chew on. The stew is served with a bowl of rice that you pour the spicy kimchi and pork shoulder mixture over. I'm already dreaming about the next cold winter day when I can come back again for this spicy hot bowl. The Ginger Scallion Noodles - my friend Lindsay of Sometimes Icing ordered. 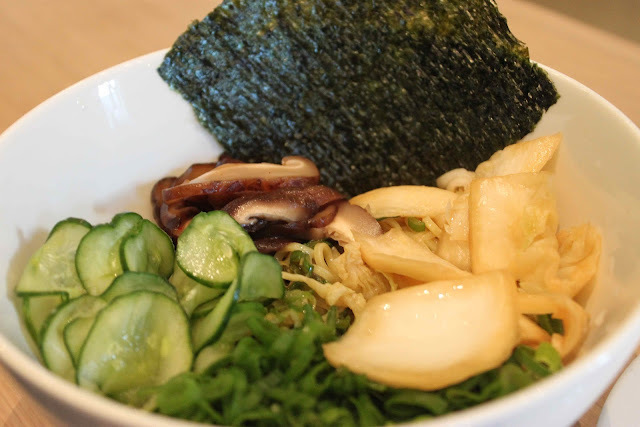 It looked super delicious with thin slices of cool cucumber and extremely flavourful mushrooms - that I did try. It's served cold over their famous ramen noodles. I have tried the famous signature Momofuku Pork Belly Buns at the NYC location before. So I opted for the Chicken Buns which came in an order of two with shredded meat and crispy chicken skin. I liked this a lot, especially because of the textures of the tender meat, crunchy skin and fresh cucumber. 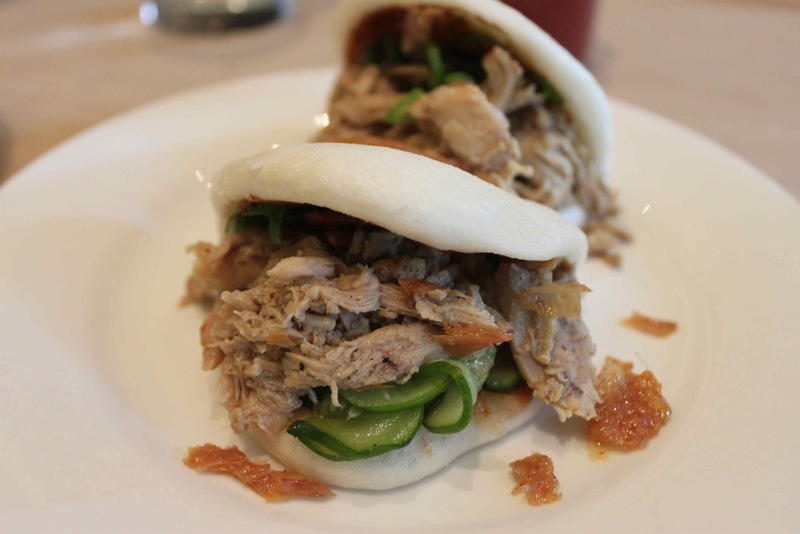 The buns are deconstructed from what you expect at dim sum. I love the soft white bun - it's so airy and makes the whole thing feel like a slider sandwich then what you think of when you think bun. Getting A Table - Your best bet is to go at lunch time if you work downtown and can sneak away from the office. Try right at 11:30 AM when the restaurant opens or at 1:15 PM when things are slowly winding down. I showed up at 2 PM and we were pretty much the last people seated and the last to leave. Next time I would aim to be there much earlier, the crowds are definitely getting less crazy. If you're thinking dinner, I would aim to be there by 4:45 PM at the latest to score a seat right at 5 PM. Otherwise if you show up at 6:30 PM on a Friday or Saturday - you're looking at a two hour wait and I'm not kidding - you will be hangry, do not do this. They are only so many $16 cocktails that you can drink at Momofuku's lounge/bar, Nikai upstairs. 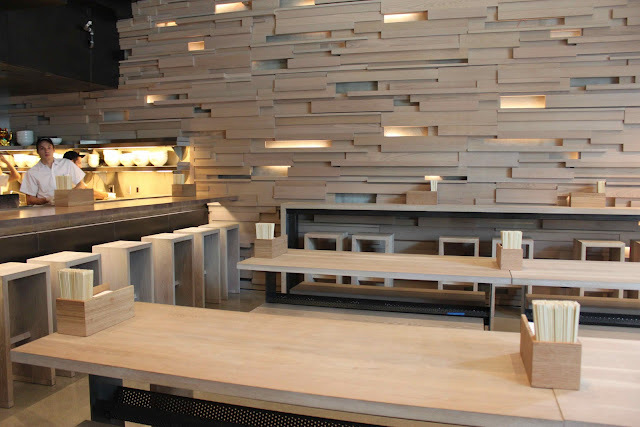 Momofuku Noodle Bar is located inside the new Shangri-La Hotel in Toronto on the ground level. They do not accept reservations and operate on a first-come, first-served basis. But they will text you when your table is ready, but you won't be seated until everybody in your party is there. 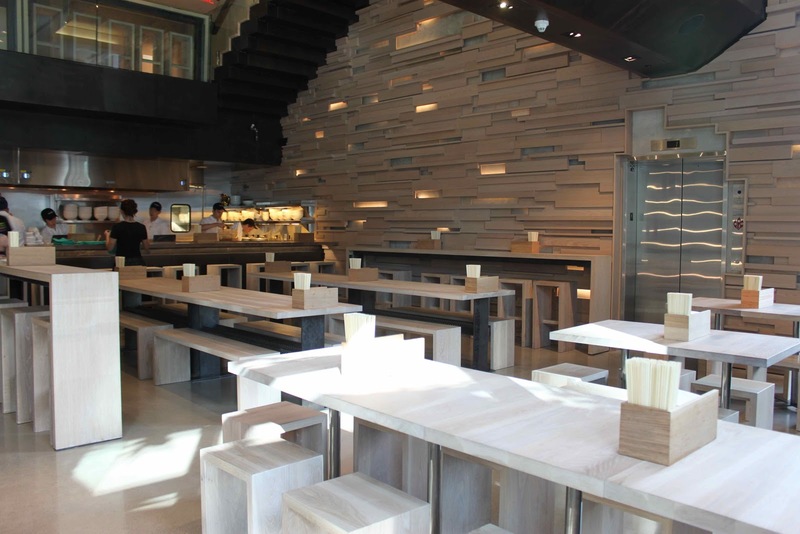 Have you been to Momofuku yet? What did you think? How long did you wait? I came here with a bunch of mates and we were all horrified with the taste. What a disappointment.